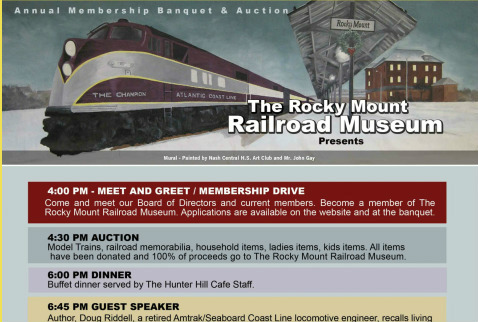 THE ROCKY MOUNT RAILROAD MUSEUM, a 501(c)(3) non profit organization, will host its second Annual Membership Banquet and Auction on Saturday, APRIL 26, 2014 at 4:00 P.M. The event will be held at The Hunter Hill Café, 501 Old Mill Rd., Rocky Mount, NC 27804. The guest speaker will be Doug Riddell, a retired Amtrak/Seaboard Coast Line locomotive engineer. He will recall living in Rocky Mount, a town shaped by the railroad and explain why it is in a unique position to host a museum dedicated to railroaders. Mr. Riddell is also Co-Author of Virginia’s Legendary Santa Trains. 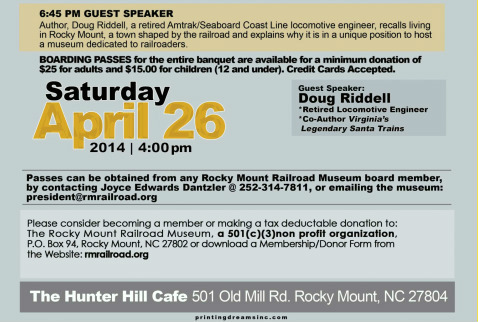 Contact any museum members or Joyce Edwards Dantzler @ 252-314-7811 or president@rmrailroad.org for ticket and/or donation information. Boarding Passes for the banquet and auction are: $25.00/Adult and $15.00/Children 12 years and under.